Two decades after the poisoning, an associate of Ling's family asked Richard Ash, an associate research scientist in the University of Maryland's Department of Geology, to analyze several of Ling's hairs collected in 1994 and 1995 to establish a timeline of her poisoning. Although Ash specializes in analyzing geological samples, he frequently helps a variety of researchers by analyzing trace elements in samples using mass spectrometry, a technique that can measure elements at the parts per billion level. "To my knowledge, this is the first use of mass spectrometry to reconstitute the timeline of a prolonged case of intentional heavy metal poisoning," Ash said. "The analysis showed that the victim was poisoned in many doses that increased in frequency and concentration over time." Mass spectrometry makes finding even low concentrations of thallium in hair easy, but measuring the amount of thallium in a hair sample is challenging. Other laboratories turned away Min He, the Ling family associate and Ash's co-author of the study, because there was no established method for this type of analysis. "Mass spectrometry is not good at measuring concentrations," Ash said. 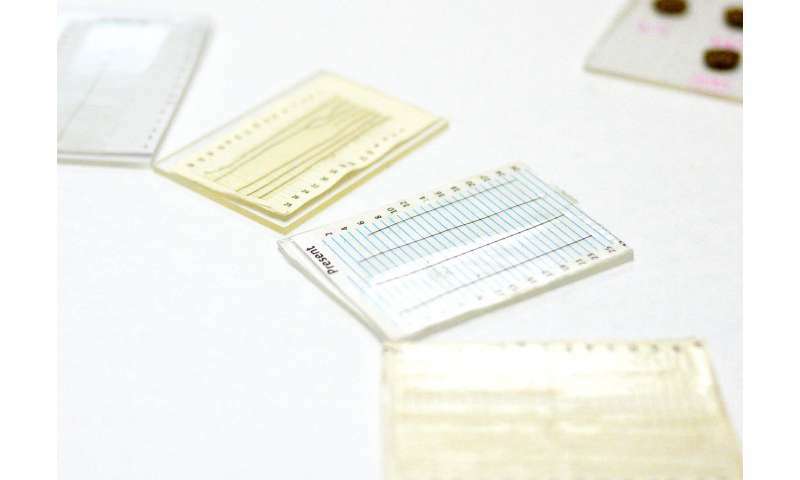 "To do that, you need an established standard reference material to compare your sample against. And there are no such standards suitable for measuring thallium concentrations directly from a strand of hair." Ash made his own standard using a standard reference material made out of orchard leaves, which was developed by the National Institute of Standards and Technology (NIST) to measure certain elements in biological samples. Ash added known quantities of thallium to the NIST material to create a new set of standards that allowed him to determine how much thallium was in the victim's hair. As an additional level of quality control, Ash tested his measurements derived from the NIST-based standard against a powdered hair standard from China and found that his measurement of elements in the victim's hair samples closely matched those in the powdered hair standard. "To be honest, I was surprised that the new standard worked so well," Ash said. "Developing my own standard was a shot in the dark, but it paid off." Next, Ash took advantage of the fact that human hair grows—and incorporates chemicals from the body—at a constant rate. Because of this characteristic, measuring the distribution of certain metals along a hair's length is an established method to determine the timing and dosage of a person's exposure to the metal. To measure thallium in the victim's hair, Ash scanned the length of the hair with an ultraviolet laser. The laser's energy converted the outermost layer of the hair into tiny particles. Ash then used a mass spectrometer to analyze the particles for thallium. Using the growth rate of hair and the scanning speed of the laser, Ash converted his measurements into a timeline of thallium ingestion. Ash used this technique to analyze several of the victim's hairs, which were collected at different times in 1994 and 1995. One hair that began growing when Ling was asymptomatic revealed about four months of sporadic exposure to thallium, with increasing dosage and frequency until the hair fell out around December 1994. A second hair, which fell out around March 1995, showed about two weeks of constant ingestion of large doses of thallium. "I hope that the new information our work has provided may one day lead to the perpetrator being brought to justice and Zhu Ling's family gaining some solace from seeing that," Ash said.